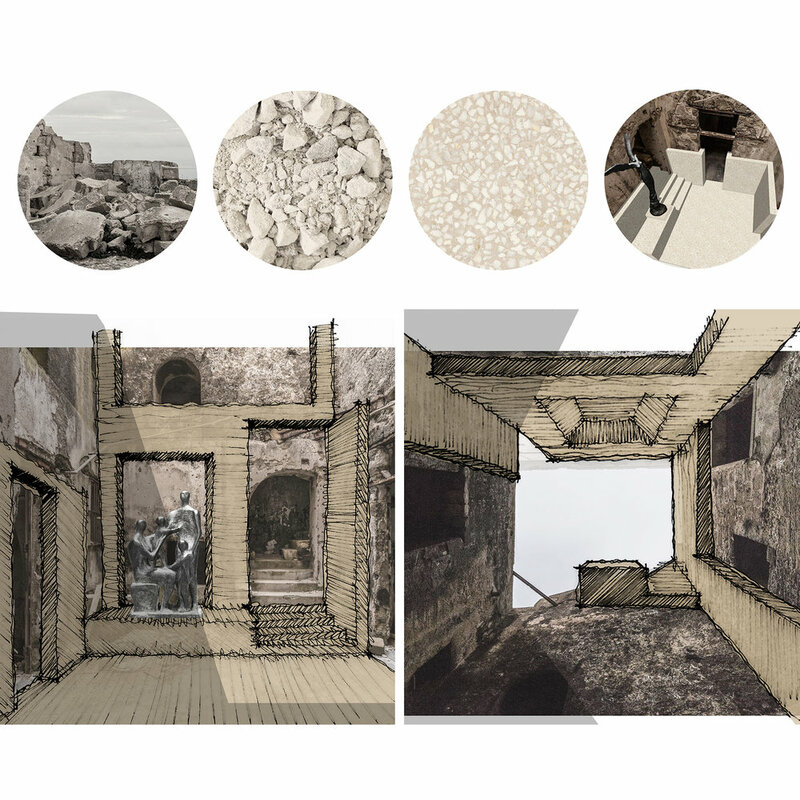 In 2018 Connolly Wellingham submitted proposals to an open call ideas competition for the conversion of the ancient hilltop fort of Santa Caterina, on the Mediterranean island of Favignana, into an international centre for the creation and exhibition of contemporary art. The island of Favignana is perfectly scaled for contemplation and art. It is at once compact and comprehensible, yet large enough to draw one out into expansive reflection. The fortress sits beautifully upon the island. It overlooks the town from its rocky outcrop without overbearing or threatening. Rather, it sits in a quietly dignified manner, seeing all. In considering the brief, we have been drawn toward the notion of the site as a sacred city, in which pilgrims arrive to venerate the art within, but also forming a dwelling space for artists within the mountain. 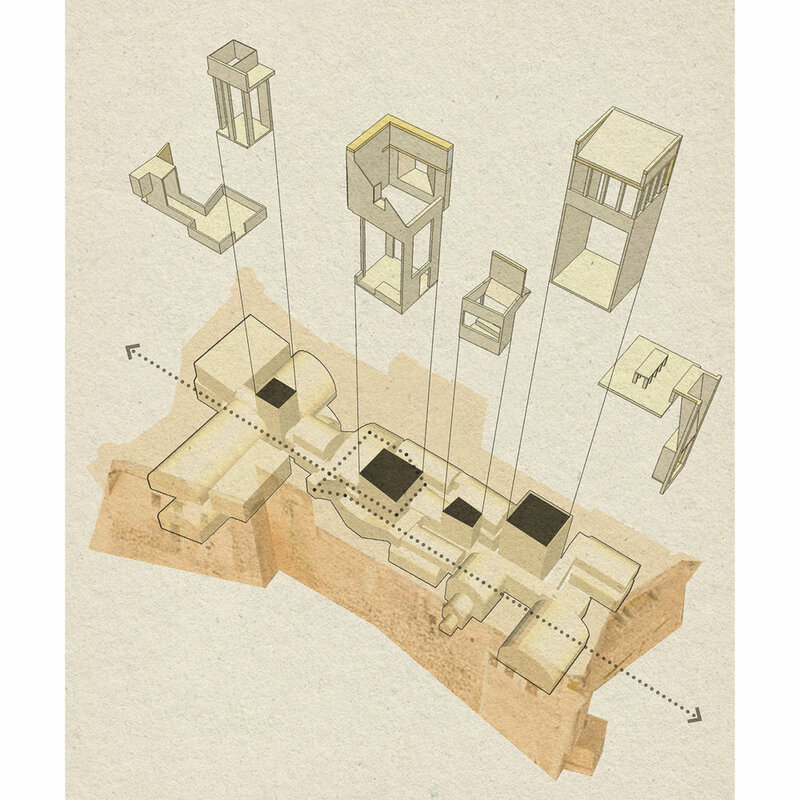 Inspired by the cell frescoes of Fra Angelico in San Marco Convent, and reinforcing the peaceful communal qualities of a monastic arrangement, the scheme proposes a complex of buried spaces in a new plinth at the base of the fortress. The labyrinth of the fortress itself is inhabited in its ruined state, a ragged armature upon which art can be mounted and arranged. A new lining is added to the existing surfaces to curate the visitor’s route through the spaces and receive carefully placed artworks. The lining is proposed as a cast terrazzo finish, using the rubble and aggregates directly from the site and the surrounding island. Cut and polished to a crisp finish, the terrazzo adds a clean, legible new layer to the surrounding ruin – but one that recognisably belongs to the mountain. Two existing lightwells draw daylight deep into the heart of the fortress, and mark the courtyards around which the circulation loosely orbits. In response to this two new lightwells are proposed to bring further daylight and atmosphere down, to further enliven the subterranean spaces in preparation for their new use and the exhibition of art. Each lightwell is crowned with a lantern, using delicate and formal pavilions to celebrate the intervention to the heavy and informal structure below, and landmarking the fortress’ new use in the wider landscape. The rooftop plaza is the culmination of the pilgrim’s route, and the arrangement of lanterns gives the clearing a strong urban character; framing views, curating the placement of art, and bounding a generous space for congregation and celebration beneath Favignana’s vast sky.